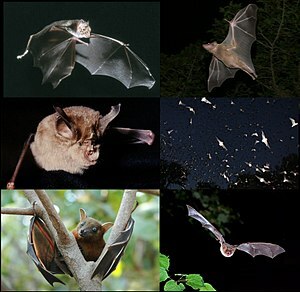 Clockwise: common Egyptian fruit baukie Rousettus aegyptiacus, Mexican free-tail baukie Tadarida brasiliensis, Myotis myotis, lesser short-neb fruit baukie Cynopterus sphinx, horseshae baukie Rhinolophus ferrumequinum, common vampire baukie Desmodus rotundus. Baukies or baukie-birds is the anely mammals that can flee richt. Like maist ither mammals thair bouk is kivert in fur. Baukies gies birth tae live young that feeds on their mither’s milk. Thair weengs is made o wabs o skin that's streekit atween lang banes seemilar tae the banes o a haund. The thoum haes a heukit end that helps the baukie hing whan it isna fleein. The feet haes wee cleuks an is usied for sclimmin, haudin on an groomin. Baukies is nocturnal ainimals. Thay ruist aw day, coueryin thegither, aften heelster-heid, in daurk bieldie places. At gloamin time or efter thay lea' thair ruist an stairt tae hunt for insects. Aboot aicht different kinds o baukies is fand in Scotland. Thay aw hae a wee bouk, nae bigger nor a moose. The maist common baukie-bird is the pipistrelle (Pipistrellus pipistrellus). A lairger baukie is the lang-luggit baukie (Plecotus auritus). Ithers is Daubenton’s (Myotis daubentoni) an Natterer's (Myotis nattereri). Wikimedia Commons haes media relatit tae Chiroptera. This page wis last eeditit on 14 Februar 2017, at 06:16.